The “Sous-Rire” is my coup de coeur gourmand of the moment ! The cuisine : delicious ! Simple, good, neither not too much nor not enough, just enough to make you wanted to come back. As starter, crumble of tomatoes and goat cheese with honey. As a main meal, piece of beef meat with maitre d’hotel butter or pepper sauce, home-made potatoe purée. Finally as a desert a cake of apricots with raspberry coulis. A délice ! The service : simple and pleasant, just like the cuisine. The boss is smiling, and his paternalistic tone with his trainee gives you the impression to feel at home. The room : warmful, cosy and juste big enough to welcome the gourmands we are ! The story of the restaurant : heard from the own mouth of the boss ! He had already another restaurant (today gis brother is in charge of it) and his waiters made jokes of him as he always insisted on the “smile”, always the smile ! Finally, lasty point not to forget : the price ! 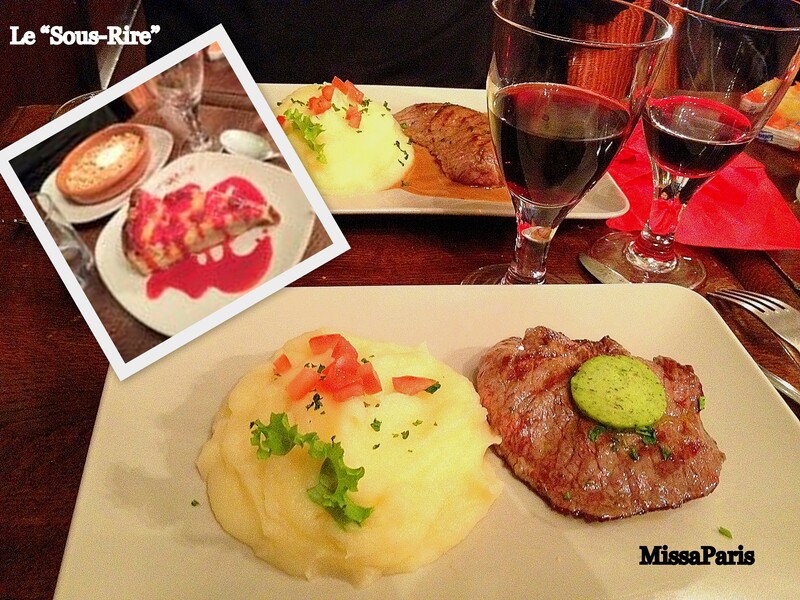 24,5 € for a menu starter + main meal + desert + glass of wine (and good one !). Open every day except on Sunday.